The Asia Journal of Global Studies (AJGS) hosted at www.ajgs.org uses Open Journal Systems 2.4.4.1, which is open source journal management and publishing software developed, supported, and freely distributed by the Public Knowledge Project under the GNU General Public License. Also we expect submissions containing images and other multimedia creations to make sure that all such contents are properly licensed for such usage, and that these contents are properly referenced in the paper in addition to the text references. We recommend using Creative Commons and Wikimedia Commons for finding such multimedia materials. There are two main "Home" pages: one for the Open Journal System as a whole, or Main Site Home Page; and a journal-level Home Page. Both home pages contain much of the same information, but differ in certain respects. Home and About provide information about the site (as opposed to an individual journal). Log In allows you to create a user profile if you have not already done so. See Register and Profile. The Log In link will be replaced with a User Home link once you register and log in. See User Home. Register allows you to add a journal to your User Home Page. Search allows you to search the entire site or just an individual journal. See Search and Browse. 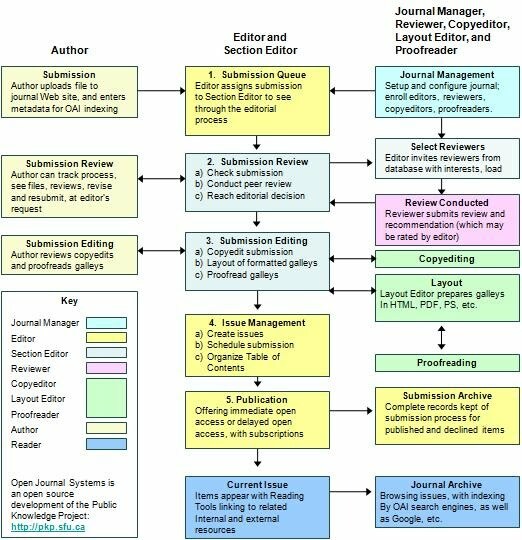 Open Journal Systems link will take you to the Public Knowledge Project website, which provides resources for Open Journals Systems and other related software. Journal Help link provides context sensitive help. User Heading the form under the User heading allows you to log in if you have a username and password. After logging in you will be taken to your User Home page. Once logged in, there will be links under User to a list of journals you have registered to; to your profile; and to log out. Language allows you to choose a language supported by OJS. Journal Content the search field under Journal Content allows you to search the site in a basic variety of ways. For a more comprehensive search, click the Search link on the top navigation bar. Font Size allows you to make the site font size smaller or bigger. There is also information for Authors, Readers and Librarians listed in the right navigation bar.